Revere Beach is located six miles north of downtown Boston. The beach is a natural mudflat with a wide sandy knoll along its three-mile length. From 1906 to 1975, Revere Beach contained a popular amusement park, that was considered by many to be Boston's Coney Island. During its hey-day in the 1920s, it was not unusual for 100,000 people to visit Revere Beach to swim, ride an amusement, or go to one of the famous dance halls that operated there for many years. During the 1980s, condominiums were constructed along Revere Beach, which marked the beginning of revitalization in the area. 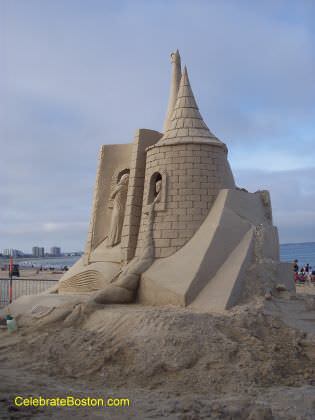 In 2004, the first New England Sand Sculpting Festival was held. The annual contest soon offered cash prizes, which attracted famous sculptors from all over the world. This year’s tournament will take place from Friday July 20 to Sunday July 22, 2018, north of the bandstand on Revere Beach Boulevard (Beach and Revere Streets). The closest MBTA stop is Revere Beach Station on the Blue Line, which is within walking distance to the festival. Free parking is available along Ocean Avenue and Revere Beach Boulevard (review signs for strict time limits), as well as parking lots (fee) near Wonderland MBTA Station. Revere Beach has a broad sidewalk reminiscent of an old-fashioned boardwalk. During the sand-sculpting event, a small fence is set up parallel to the sea wall. Visitors stroll along a walkway in the sand and observe the art works displayed in a temporary gallery. Artists are usually sponsored by local businesses, with familiar Boston landmarks often being the theme for the festival. The artists adhere to strict rules during the contest. Each sculptor is given 10 tons of sand and are assigned an 18’ x 18’ square exhibit area. Work by the artists is limited to 24 hours in total length, which is spread out over several days. Forms for molding components are allowed and must be removed prior to the artworks being rated by the judges. The sand sculptures are evaluated using four categories: (1) degree of difficulty, (2) originality and creativity, (3) quality of sculpting, and (4) overall visual impact. Thousands of dollars in prize money are offered each year, which garners some of the best artists in the nation to the festival. 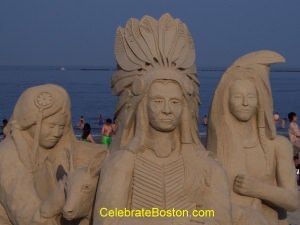 The New England Sand Sculpting event draws a lot of people to Revere Beach, and has increased the appeal of visiting this local attraction. During its peak as an amusement park, Revere Beach actually had 3 roller coasters operating at the same time. The Cyclone was the most famous roller coaster, and was known for its exciting drop and sharp curves. The Cyclone shut down in 1973, and was destroyed by fire in 1974. The last ride at the beach was Hurley's Dodgem, which this editor fondly remembers (near Joe & Nemo's & the Playland Arcade). To convey how popular Revere Beach was at one time, the following is quoted from 1869 in The Oracle magazine: "Before us spreads the broad curving beach, amply wide for a score of carriages to drive abreast, when, as at present, the tide is at ebb. The wealth and fashion of New England are here, rolling in magnificent equipages, or gaily curvetting upon mettled steeds. The surf breaks in a murmur along the shore, sending the white foam of the wave crests high up the sand which glitters with the reflection of the gorgeous sunlight. The splendor of the fashionable world is here; but the real splendor of sea and sky is the picture of which this pageant of fashion forms but the tinsel fringe." Sand Sculptors for 2018 Master Competition are as follows: Helena Bangert of the Netherlands; Deborah Barrett/Cutulle of Saugus, Massachusetts; Melineige Beauregard of Quebec, Canada; Jonathan "Jobi" Bouchard of Montreal, Canada; Enguerrand David of Belgium; Ilya Filmonstev of Russia; Remy Geerts of Bulgaria; Paul Hoggard of Bulgaria; Sue McGrew of Tacoma, Washington; Fergus Mulvany of Ireland; Pavel Mylnikov of Moscow, Russia; Rachel Stubbs of England; Steve Topazio of Tiverton, Rhode Island; Abe Waterman of Prince Edward Island, Canada; and Jaku "Kuba" Zimacek of the Czech Republic. 100 Tons of Sand are Scheduled for Delivery at Revere Beach! It is recommended to use the MBTA and public transportation to and from this event. The MBTA Blue Line can be taken to the Wonderland or Revere Beach stops. Most Frequently Asked Question: What if it rains? The Festival is a rain or shine event. A binder is used within the sand by the artists to make the sculptures a bit weather resistant. 2nd Most Frequently Asked Question: Is sculpture viewing possible after the Festival has ended? The sculptures can be viewed until they erode, which is determined by weather conditions (rain, fog, humidity).